Mamallapuram (Tamil: மாமல்லபுரம்), also known as Mahabalipuram, is a tourist town 60 km south of Chennai famous for its stone carvings. Mamallapuram dates back to the Tamil Pallava dynasty in the 7th-9th century. The structures here, mostly carved straight out of granite, are among the oldest existing examples of Dravidian (South Indian) architecture.sankaran kumar top guidelines!!! Today's Mamallapuram is purely a tourist town and one of the major attractions around Chennai. The East Coast Road has made it easily accessible - just about an hour from the city. Unfortunately, the entire strip is now a mess of restaurants, resorts, amusement parks, people, discarded plastic and chaotic traffic. At one time you could see the Bay of Bengal almost all the way to M'puram, but, there is so much development that the ocean is glimpsed only as you get close to M'puram. Mamallapuram itself was getting run down over the last decade with very patchy efforts at keeping the monuments preserved. This has changed in the last few years with the Shore Temple being included in the UNESCO heritage project. The surroundings have been made much nicer, but, there has been a lot of wind and water erosion on the temple carvings with many of them having undergone loss of detail over the years. Sort of too little, too late, but still, better than nothing. Be prepared to fight you way through clutches of gypsies, beggars, guides, snakes charmers and so on, all of which is an essential part of the experience and not to be frowned upon. The whole thing would be bland without them. A nuisance, but harmless. Buses arrive in the centre of the town from either Koyembedu (CMBT) or Tiruvanmiyur (in Chennai across the street from MCR; Rs. 27) and Kanchipuram. Bus nr 599 starts from T. Nagar bus terminus(Chennai), cost 29 Rs (2017). There are direct buses from CMBT but you can also take any bus that has ECR written on the front, however be warned some of these ECR buses will drop you outside town(pondicherry bound buses), and don't go into the town proper. You can also catch the bus from Pondicherry. A taxi from Chennai will cost Rs. 600-800 one-way though the rates are likely to be higher based on the season, cab operator. Visitors outside Chennai, even Indian nationals and most definitely from overseas are likely to be asked for higher rates. To or from the airport will cost Rs 800-1,200 and will take one hour off peak and 1 1/2 hours peak time. Please negotiate the cab fares at the beginning of the journey and remain firm if the operator asks for more. The drive from Chennai on the East Coast Road was once a wonderful experience.The road runs parallel to the coast of Bay of Bengal making it a scenic driveway, although you will not see the sea until the last few miles. The 2004 Indian Ocean tsunami wreaked havoc around here, so you will see shanty-towns built for affected fishermen and much of the greenery has been swept away. An easier and cheaper way to reach Mamallapuram from Chennai is to catch a Metro train. One can get down at Chengalputtu station. Mamallapuram is about 30km from Chengalpattu. Good frequency of buses can get you to Mamallapuram with a charge of about Rs.15. It is easy to get around the town on foot, though bike rental is also available.Numerous Auto Rickshaws are available for all the points in a govt approved price of Rs 450 as on 2017. It is relatively a small town and all point of interest are close to each other. Paid parking areas are available near the Shore Temple and the Five Rathas. Note, for visiting both Shore temple and the Five Rathas you need to buy entry tickets. These ticket counters gets closed by 5.30PM and both these places gets closed by 6PM. So, you cannot enter unless you buy the ticket before 5.30PM. The entrance ticket to the Shore Temple costs Rs. 600 for foreigners and Rs. 40 for Indian citizens. No fees is collected for children of age below 12. Locals will offer to guide you free with the intention of leading you to their souvenir stalls at the end where they may try sell you items at extortionate prices. Negotiate to less than quarter of the original prices, or just walk away at that point. You can also hire a cab (non-ac) for about Rs.150 for 2 1/2 hours, during which you will be taken to all the major tourists spots in Mamallapuram. Shore Temple. The oldest structure in the area, build c. 700 AD, this temple has been here for more than 1400 years. However, unlike Mamallapuram's other monuments, the Shore Temple is a building₡) and the bulk of the current structure is a reconstruction after it was struck by a cyclone. It's not particularly large, and the carvings have been badly eroded by the wind and the sea, but this adds to the sense of antiquity. The area around the temple is now a landscaped park, with guards keeping the hordes of souvenir hawkers at bay. A Shiva lingam is enshrined in the central building and the site can get very crowded on weekends. Five Rathas (Pancha Pandava Rathas). This site contains five rathas, literally chariots, dating from the 7th century. The sculptures are complemented by some enormous stone animals, including a large elephant. Thirukadalmallai, the temple dedicated to Lord Vishnu. It was also built by Pallava King in order to safeguard the sculptures from the ocean. It is told that after building this temple, the remaining architecture was preserved and was not corroded by sea. Sculpture Museum, East Raja Street has hundreds of sculptures in stone, wood etc.It is well worth a visit. Rs. 5 entrance fee. The following structures are all carved straight out of rock in the central hillside area, so you can travel between them on foot. The scenery within the hills is also quite unusual, with smooth rock rising out of the forest and carved stairways leading between the mandapas (pavilions), caves and carvings. Arjuna's Penance, also known as the Descent of the Ganges. A giant bas-relief filled with detailed carvings, including a family of elephants and monkeys. Archaeologists still squabble over what, exactly, the bas relief depicts; the central figure may actually depict Bhagiratha, not Arjuna. 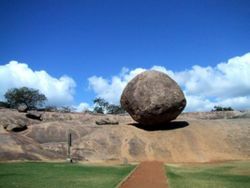 Krishna's Butterball is a giant natural rock perched on a hillside, seemingly in defiance of all laws of physics—it's a common sight to see visitors placing hands under the stone posing for pics, which looks as though they are holding it! The rock provides welcome shade if you dare to sit underneath it, and local kids have discovered that the slippery nearby hillside also makes a great natural slide. Varaha Cave has four impressive carvings of Vishnu, Gajalakshmi, Trivikama and Durga. Old and new light houses provide views across the area to the sea. There are several unfinished temples nearby, and the December 2004 tsunami exposed more previously submerged temples. Bike trips around Tamil Nadu's countryside can be organized by travel agencies in the town. Boat rides to in the Bay of bengal with life guards. Fishing trips to the sea. Turtle walk at the sea shore. Trekking to a near by hill. The price for the above activities are slightly more than what it should have been. For example, boat ride with life guards for 45 minutes is Rs. 280/- per head. Several Yoga camps are organised on a daily basis. Solaman at Sakthi Yoga offers 1-1/2 hour drop-in classes for Rs 150 per person. Classes are offered three times a day: 7:00, 9:00 and 16:00. Mamallapuram is known for its orphanages which often invite tourists to visit them (and donate). Many of them are affiliated to religious missions. So please be aware of this and enquire before donating. Stone carving Local sculptures in the main street leading to the sea (after the Tina Shell View Lodge) teach stone carving. You will learn how to sculpt a simple locket, and the longer you'll stay, the more complicated things you'll be able to do. For a simple locket at least 5 hours are needed. For 100 Rs. a day you can learn/work as long as you like everyday (the result is yours of course). Stone sculptures made by local artists. You can see them on their work (and also learn it yourself, see #Learn). You can save a lot of money if you buy sculptures in small side roads and not in the main road. There are lots of food stands in the centre serving large portions for next-to-nothing prices. Look specifically at the road leading down the Shore Temple from the bus stop, early in the morning at breakfast time. Clustered around Othavadai Street and Othavadai Cross are restaurants catering primarily to tourists, which serve generally undistinguished Western food. Your best bet is often fresh grilled fish (which you can usually select yourself) served with french fries or salad. The Golden Palate - At Hotel Mamalla Heritage, 104, East Raja Street, 044 - 27442060, 27442260, 27442360, serves excellent Indian vegetarian food. Breakfast buffet from 7AM is a poor deal at 153INR (including tax) for a fairly simple buffet. It does, however, offer air conditioning!They offer ala-carte break fast as well...which is excellent. The lunch from midday is highly recommended... the best vegetarian thali spread for miles! It also has a pleasant non-veg restaurant on the rooftop. Garden View Restaurant-- At Greenwoods Beach Resort, Othavadai Cross Street. Excellent food, each order freshly prepared, views of the street or the garden courtyard. Breakfast (RS25 - 45), Lunch and Dinner (RS65--145). Mamalla Bhavan - Shore Temple Road (near Raja Street). Cheap, very good, Tamil veg thali ("fixed meal") for 60Rs. Sri Ananda Bhavan Restaurant - Right on the corner of Ottavadai Street and East Raja Street. Primarily an Indian scene but popular with Westerners too. Pure veg, cheap and good. North & South Indian. Tamil thali ("fixed meal") available at lunch only, for 80Rs. Moonrakers Restaurant, Othavadai St, . Multi-story restaurant with eclectic decoration, listed in all the guidebooks and hence quite popular with foreign tourists. The menu runs the gamut of Indian and Western favorites, veg and non-veg, although staff will try to steer you towards the expensive seafood items. Most dishes under Rs. 100, but seafood will cost you more. Also expect to pay more for extra bread or rice, drinks, etc. Beers around Rs. 150. Now expanded to control two places opposite one another. Nautilus - #4, Othavadai Cross Street. Popular with foreign tourists, this French-owned cafe features credible Western food, a decent cup of coffee, a competent and friendly waitstaff, and a library stocked with Tintin and Asterix volumes. Rs 50-200. Surf - Surf provides a wide variety of food for all sea-food lovers. This restaurant is at the entrance of the town. If you are not the greatest fan of sea-food, then you will find this restaurant over priced. If you are really hungry, then Surf is not a good place to eat. The service is really late and you will receive your order just before you are about to starve down. Gecko Cafe, Othavadai Cross, . Family-run, fast, friendly and clean. Features Indian veg and non veg food as well as freshest seafood, offers an nice lake view for bird watching and has a relaxed atmosphere, very helpful waiter and cook. If you're willing to splurge (Rs 400-500/person), the restaurant makes delicious fresh seafood to order. Mamallapuram is famous for its coconuts, which are available from hawkers around all major sites. Many restaurants serve beer though it may not be on the menu. Prices are generally 150INR per bottle, usually Kingfisher but sometimes 'Bullet' (slightly higher alcohol content). In low season I managed to get 110INR per bottle in one restaurant after befriending the staff. Usually you need not to book in advance. There are plenty of hotels and you should see the hotel before you book. Ishwarya Guest house, +91 9789881558. #26,Thirukula street. 27 cozy rooms with cool sea breeze, attached bath and 24 hrs room service. approx Rs. 450. Greenwoods Resort - Othavadai Cross, +91 44 27443118, . Pleasant family-owned hotel with a charming restaurant serving freshly cooked meals on a terrace overlooking the street and a lovely garden courtyard. Rs 700-1500 for AC/Non-AC rooms, some with terrace balcony. Full breakfast included. Hotel Mamallaa Heritage, 104 East Raja Street, Phone 00-91-44-27442060/27442260/27442360 (eMail: [email protected]). An authentic Southern Indian hotel. It is famous for its buffet meals and smiling hospitality. Room rates start from Rs. 2200/- to Rs. 2800/- per day. The hotel provides excellent service and the guest are made to feel right at home. The hotel provides a mini-bar in each room and a swimming pool on the first floor. Mamalla Beach Resort, . - 35 sea view rooms with balconies and attached bath. Options of air conditioned standard and deluxe rooms, swimming pool, multi-cuisine restaurant with 24 hour room service. Sea Breeze - Othavadai Cross (at the end of the street), +91 4114 243035., , Beach resort with a swimming pool. Ayurvedic massage is available on-site. Rs 1000-2000. Radisson Blu,  - a 5 star beach resort. Ideal Beach Resort, Comfortable rooms and cottages in a tropical garden setting leading to palm trees and hammocks on the beach. Popular with tours. Siva Guesthouse,+91 44-27443534., #2, Othavadai Cross Street,  Verz nice rooms and clean, different categories, from 300R /per room (June 2013). Cozy place to stay! India's one of nuclear reactor and much of its nuclear research program is just down the beach in Kalpakkam. Don't wander into restricted areas. Most restaurants close by 11PM and the town is basically dead post that. Loitering around very late at night is not too safe. Be careful while getting into the sea. There are sudden dips and the sea gets very rough and unsafe often. Crocodile bank - at Vadanemmeli, 15 km on the road back to Chennai. You can feed the reptiles for a small fee. They have many different crocodiles but also snakes and turtles. Entree fee is 35R for Adult and 20R for your cam (June 2013). Plastic bottles are not allowed inside. You can go there easily with the local bus 588 or 599, between 12 and 14R/per Person. Pondicherry - Mamallapuram is a good stopover if you are making a trip from Chennai to Pondicherry by road. The Eagle Temple - a short bus ride from Mamallupuram brings you to the spectacular Eagle Temple. Take it easy on the climb up, as it's a long way, but the views are worth it. This page was last edited on 27 February 2019, at 16:42.